The “car men” – streetcar operators – of Spokane declared “war” on one-man streetcars. Spokane’s streetcar companies were increasingly trying to cut costs by running streetcars with just one motorman instead of a motorman and conductor. The Spokane local of the Amalgamated Association of Street and Electric Railway Employees was demanding the elimination of the one-man cars. Jobs were the underlying issue, but the union was also making its case on the basis of safety. The streetcar companies said cost reductions were necessary to compete with jitneys – largely unregulated private autos or vans that gave people rides for a fee. 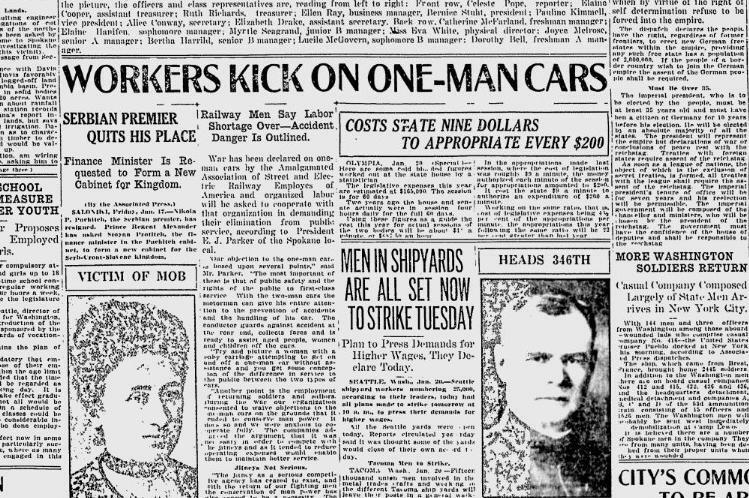 Also from the labor beat: Tens of thousands of shipyard workers in Seattle and Tacoma announced their intention to go on strike the next day.